A Friday report in the New York Times revealing that the FBI supercharged its Trump-Russia collusion investigation after President Trump fired FBI director James Comey appears to have backfired - especially when one reviews internal FBI communications from the time period in question. The Daily Caller's Chuck Ross has made a brilliant observation, noting Peter Strzok - then the FBI's deputy chief of counterintelligence, admitted to his FBI lawyer mistress, Lisa Page, that there was no merit to the investigation. Nine days after Comey was fired and the DOJ "sought to determine whether Mr. Trump was knowingly working for Russia," Strzok texted Page on May 18, 2017: "You and I both know the odds are nothing. If I thought it was likely I’d be there no question. I hesitate in part because of my gut sense and concern there’s no big there there." It is unclear from The Times report what information was used as a predicate to open the investigation. The article suggests that the FBI had long considered the move and that Comey’s firing and Trump’s subsequent comments marked a tipping point. The Times' explanation for the FBI's rationale that Trump may have been a Russian asset consists of Trump's call for Moscow to release Hillary Clinton's emails an election debate, and allegations contained within the unverified Steele Dossier. The Times was also quick to note that Trump may have "unwittingly fallen under Moscow's influence," to temper the accusation that he was an agent of a foreign power. In short, weak sauce. 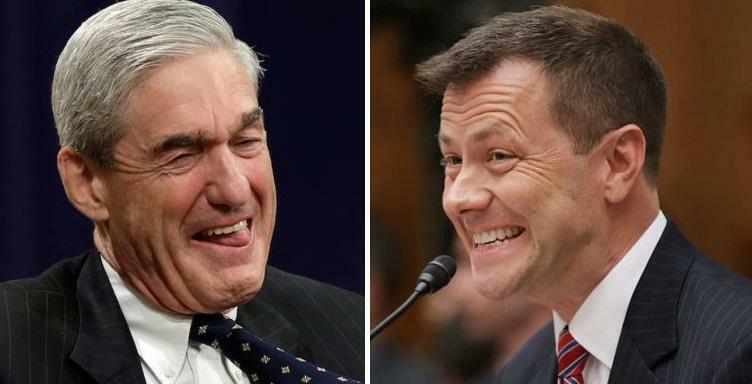 It's no wonder Strzok was hesitant to join Mueller's team. Interestingly, another series of Strzok-Page texts refers to "coordinating investigation" after Strzok apparently met with Deputy Attorney General Rod Rosenstein, who both recommended Comey's firing, then authorized the special counsel probe. As Ross notes in The Daily Caller, there were other text messages that between Strzok and Page which raise suspicion over whether the FBI was working on a "gotcha" against Trump. "And we need to open the case we’ve been waiting on now while Andy is acting," Strzok texted Page the day Comey was fired, referring to then-deputy FBI director Andrew McCabe. Meanwhile, Page - who served as McCabe's deputy, provided some additional color on the text messages during her July 2018 congressional testimony, suggesting that the "case we've been waiting on" text referred to an investigation separate of the obstruction probe we already knew about. “Well, other than obstruction, what could it have been?” one lawmaker asked Page in her interview, details of which were published by The Epoch Times on Friday. “I can’t answer that, sir. I’m sorry,” she replied. That said, Page admitted that Comey's firing prompted the text exchange. "So the firing of Jim Comey was the precipitating event as opposed to the occupant of the Director’s office?" asked one lawmaker. "Yes, that’s correct," replied Page. Meanwhile, The Times went to great lengths to imply that the FBI was justified in their ratcheted-up collusion investigation - failing to mention who started the probe, who led it, and more importantly - waiting until the 9th paragraph to mention the fact that it turned up nothing. "No evidence has emerged publicly that Mr. Trump was secretly in contact with or took direction from Russian government officials. An F.B.I. spokeswoman and a spokesman for the special counsel’s office both declined to comment."